Apologies to readers as the blog has suffered from the summer doldrums a bit lately. I thought today I would address a few comments I got regarding a post from Tuesday. In Tuesday’s post I showed a setup that suggested the market was likely to close higher on Wednesday than it did on Monday. This statement is based on the fact that all previous 16 instances did close higher 2 days later. I showed the results table for days 1-5 (Tues through next Mon). As sometimes happens when you deal in probabilities (and not certainties) the market did not adhere to historical norms and instead sold off. After it was clear that the SPX was not likely to finish higher on Wednesday I got a few comments from blog readers about the study. The 2nd commenter, 24/5 Trader, remarked, “Isn’t this study showing a bearish edge at the third day?” He noted that while there was a perfect record through 2 days, day 3 showed a decent number of losers as well as a drop in total profits. Let me first say that there is no “right” answer to the question of how to best evaluate a study or consider it useful. Both of these comments showed logical interpretations of the data. Now I’ll share my interpretation. Does this abnormal reaction affect my outlook? It was supposed to go up. It went down. Does that mean it will continue to go down? Does that mean it is now oversold and will likely bounce in the next couple of days? Taken as 1 individual study it is impossible to determine. My studies tend to look at one or two specific aspects of the market. In this case it was strong consistent breadth. While I found this study to be the most interesting and “blogworthy” Tuesday morning, there was also a short-term bearish study that triggered Monday night which was published in the Subscriber Letter. Additionally, there were 3 other short-term bearish studies from the Sunday night letter that were also in effect. So it wasn’t terribly surprising that the market struggled Tuesday and Wednesday. And while the strong breadth was saying we were going higher, these other studies that looked at things such as the overbought price action and weak volume suggested a pullback was in order. So in this particular case, when the market didn’t react in the “normal” way to the setup studied in Tuesday’s blog, it didn’t concern me. On the other hand, if there were a large number of bullish studies, and few or no bearish studies and the market traded lower, then I might get concerned. If this abnormal behavior persisted then I would view risk as elevated and would consider adjusting my position size and trade management accordingly. My database looks at an awful lot of information. I try and share a few tidbits on the blog each week, which I hope are often useful. But that is really all they are – useful tidbits. They are not market calls and when the market reacts the way it normally does, it doesn’t me I was right. And when the market moves opposite a study it doesn’t mean I was wrong. I do suggest trade ideas in my Subscriber Letter and I have found studies such as those I often post to the blog to be very useful in determining my bias and in making index trades. My primary tool for interpreting all the studies is the Quantifiable Edges Aggregator. The Aggregator basically takes all of my currently “active” studies and uses them to make a projection for the next few days. If you would like to learn more about the Aggregator, then below are two links. The first one is a detailed explanation of the tool from about 2 years ago. The 2nd link is to a webinar I held for subscribers about a week and a half ago. It includes a detailed overview of the Aggregator as well as a question and answer period from subscribers that posed some interesting questions. The video is about 40 minutes, so it takes some time to watch. I should also apologize for the lack of editing. I just started holding these webinars and I need to get up to speed with all the tools. It takes about 40 seconds before the presentation really gets going. I'll have a post ready in about an hour, but I just wanted to quickly point people to a new site that looks promising - ETF Prophet. It is the work of a few bloggers who I've admired for some time including Jeff Pietsch of Market Rewind and Bob Barnes of BZBTrader. In all they have a total of 7 contributors, some experienced and some new to writing. I'm familiar with 5 of the 7 contributors and suspect ETFProphet will fast become a place where readers can find some thought provoking original thinking. I'm looking forward to following them. There is no doubt that the market is short-term overbought. Often we see extreme strength reverse as profits are taken and price pulls back a bit. But sometimes when readings are extremely strong they instead suggest further strength. That is the suggestion of the below study which was emailed to gold subscribers yesterday afternoon. 16 for 16 2 days out is some very compelling results. Monday's bounce in reaction to Friday's drop came on the lowest NYSE volume in a week. 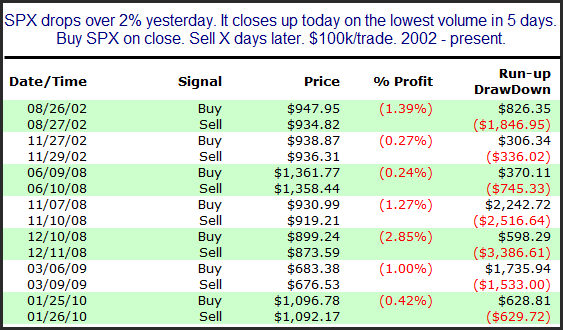 Below I have listed all instances since 2002 where the market has dropped 2% one day and then risen the next on the lowest volume in a week. This would seem to suggest a downside edge for Tuesday. One caveat though is that prior to 2002 this downside edge was not evident. Another issue is that today's apparent gap down may mean much or all of the downside edge could have been realized overnight. Studies were a bit mixed after Friday's drop. There is certainly danger of more downside. I’ve updated the Quantifiable Edges Big Time Swing System overview page with results through June 30. I don’t update it that often since the system only trades about once per month on average. I’m please to say that while the SPX was down 7.57% for the 1st half of the year, the QE Big Time Swing System managed to post a 0.93% gain. This is well below long-term norms. So while it may seem a bit disappointing from that perspective, the fact that it has weathered such historically abnormal action the last six months is inspiring. January saw the market experience an abnormally sharp and persistent selloff. This was followed by one of the most persistent upmoves ever from Feb – April. We then had to deal with a one of a kind "flash crash" and then more extreme action culminating in a wicked selloff at the end of June that triggered numerous historical extremes. With all that to think about, buy/sell decisions were easy for QE Big Time Swing traders. SPY had 7 trades trigger. Using the system, entries and exits are clearly defined and there are no extraneous variables to worry about. Of the 7 SPY trades, 4 were winners and 3 were losers for a net of 0.93% including commissions, dividends, and interest on cash (assumed at 0.16% annual this year). Again, not great, but not bad considering all the market dealt us the last 6 months. Of course these results assume traders used SPY and took the “standard” entries and exits as published in the manual and sent to purchasers via email (free for 2010). One of the biggest advantages with the QE Big Time Swing System is that it is all open-coded and comes complete with a substantial amount of background historical research. Many system owners have either incorporated ideas for “tweaking” from the manual or used their own ideas to customize the system. Anyone doing this would have experienced different results. Below is one pattern I examined in last night's Subscriber Letter that had interesting results. To qualify for the study the market first needs to be very overbought and then second it needs to pull back extremely gently. The 2-day RSI is such a sensitive indicator that any decent pullback – even from a very overbought condition – would normally see it close below 85. While the sample size is very small, historically this has always been followed by a pullback. Large gaps up like yesterday that reach new highs, go unfilled and finish above the open don't often follow through over the short-term. Below is a study that appeared in last night's Quantifinder that demonstrates this. Monday marked the 5th higher close in a row. This kind of persistence coming off a low has almost always led to further upside over the intermediate-term. This can be seen in the study below. Short-term returns were very choppy. Looking out a month or so the results strongly favor the bulls. In last night's Subscriber Letter I listed all the instances. What was interesting is that there was positive representation from every decade. It was pointed out to me that IBD declared Wednesday to be a Follow-Through-Day. Since it was only the 2nd day off the bottom this seemed odd to me. I’ve done an extensive series quantifying Follow-Through-Days. IBD’s rules have been fluid over time and sometimes nonsensical based on the evidence. From all appearances they have done very little actual research on their own indicator, and have never shared any verifiable results. One basic guideline IBD has suggested with Follow-Through-Days is that they should occur between the 4th and 10th day of the beginning of a rally. I examined FTD’s after the 10th day in the February 29, 2008 blog post. At that time I found that FTD’s after day 10 are NOT less reliable as IBD claims. In fact, the small sample was much more reliable. But what of FTD’s that occur prior to Day 4? Using the original basic assumptions from the January 14, 2008 study I adjusted the requirement from 4 days (standard) to 2 days (Wednesday’s “FTD”). Below is a quick comparison since 1970. Again, refer to the original basic assumptions for definitions of success and failure of a FTD. 4th Day of Rally Is Earliest Possible FTD – 38 winners and 35 losers. 2nd Day of Rally Is Earliest Possible FTD – 39 winners and 43 losers. So it appears that allowing FTD’s on day two did identify one additional rally. I looked to see when this additional “success” took place. It was July of 1973. The total rally only lasted 3 weeks. The reason it was “successful” if you entered on the FTD on the 2nd day off the bottom was that the “success” target of a move of twice the size of the distance from the bottom to the FTD was more easily achieved. This “successful” July rally never even went on to break the swing highs of May. Not exactly the kind of winner most traders would be disappointed to miss out on. And while it met the test definition, when looking at a chart it likely isn’t a rally that most traders would even consider successful. Also note that shortening the requirement to 2 days from 4 days triggers 8 more losers. I don’t agree with many of IBD’s teachings on FTD’s, but in my eyes this particular rule (waiting until day 4) is a very good one. I personally wouldn’t ignore it and am a bit surprised that they did. My schedule has been different this week and I haven't been able to get out blogs as easily. Sorry about that. I expect things to return to normal next week. One study that appeared in the Quantifinder from last night pointed to this post from November of 2008. The lesson there still holds true. As I type this morning the futures are up between 1% and 1.5%. 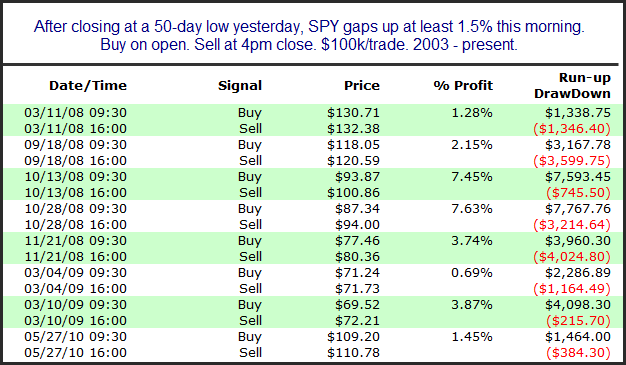 Below I show results since 2003 of gaps of different sizes occuring right after a 50-day low. First are gaps between 1% and 1.5%. Very low instances but very poor performance. Now let's look at instances of gaps above 1.5%. It appears the bigger the gap the better for the bulls this morning. Below is a study from last night's Subscriber Letter. 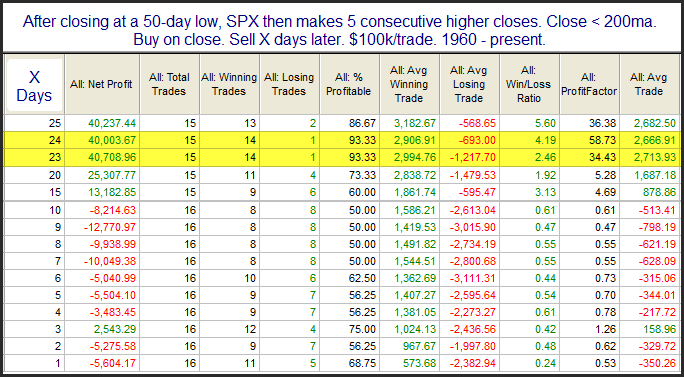 It looks at when happens when ths SPX has been oversold short-term (via RSI2) and intermediate-term (50-day low). With 8 of 9 instances trading higher and an average return of 2.65% 3 just 3 days later there appears to be an upside edge. Of course this market has been ignoring oversold conditions for several days now. Still, I'd be more inclined to bet on a short-term bounce than against one.